When powdery mildew, an infection caused by different fungi, is present on plants, the foliage appears to be covered by a white to gray powdery substance. The powder is the fungal spores, which destroy the plant tissue and cause leaf drop. Lilac shrubs are frequent hosts of powdery mildew, usually late in the summer. Even though the infection is rarely serious on the species, treating the problem improves the bush's appearance and it keeps the disease from spreading to other plants in the garden. Rake and discard the lilac leaves in the trash as they fall to prevent perpetuating the infection cycle. Prune branches holding infected leaves and discard them. In addition, cut spindly and old twigs flush with the plant's base to thin the stems, making room for air to circulate through the center of the shrub. Cover the lilac leaves with an insecticidal spray containing neem seed extract, a natural chemical also called azadirachtin that is less toxic than synthetic products. Follow the instructions on the manufacturer's label for application rates. 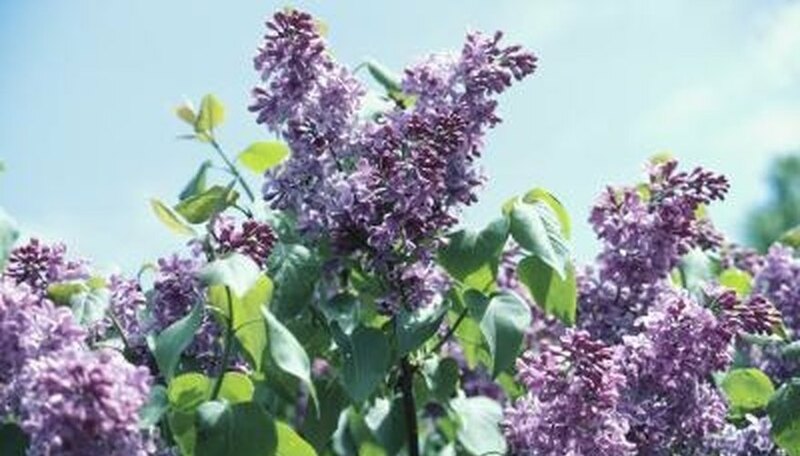 Treat the lilac with a synthetic fungicide as a last resort. Use a product containing chlorothalonil, myclobutanil or propiconazole as its active ingredient. Spray the plant every one to two weeks if the fungus appears in spring to early summer when it has the potential to compromise next year's blooms. If the spores move to the shrub in late summer to fall, leave the plant untreated but remove the diseased leaves. Clean the shears with rubbing alcohol after pruning infected lilacs to kill spores that may have transferred to the tool.